, corresponding to amino acids 579-592 of Rat PKC zeta. Rat brain and myeloid tissues. Our Abpromise guarantee covers the use of ab4137 in the following tested applications. WB 1/250. Predicted molecular weight: 71 kDa. (using horseradish peroxidase or alkaline phosphatase). ICC 1/250. Frozen. (using horseradish peroxidase or alkaline phosphatase). This is a calcium-independent, phospholipid-dependent, serine- and threonine-specific enzyme. Phosphorylates 'Ser-311' of RELA subunit of NF-kappa-B. 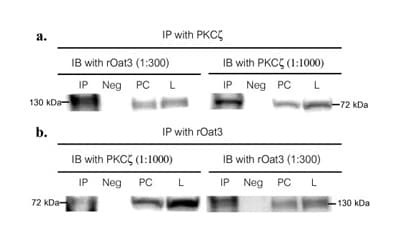 PKC is activated by diacylglycerol which in turn phosphorylates a range of cellular proteins. PKC also serves as the receptor for phorbol esters, a class of tumor promoters. Subunit of a quaternary complex that plays a central role in epithelial cell polarization. Expressed in brain, and to a lesser extent in lung, kidney and testis. The OPR domain mediates mutually exclusive interactions with SQSTM1 and PARD6B. CDH5 is required for its phosphorylation at Thr-410. Cytoplasm. Endosome. Cell junction. In the retina, localizes in the terminals of the rod bipolar cells (By similarity). Associates with endosomes. Presence of KRIT1, CDH5 and RAP1B is required for its localization to the cell junction. Western blot - Anti-PKC zeta antibody (ab4137)Image from Barros SA et al, J Biol Chem. 2009 Jan 30;284(5):2672-9. Epub 2008 Nov 21, Fig 2. Publishing research using ab4137? Please let us know so that we can cite the reference in this datasheet. Thank you for your inquiry. I have conducted a search for you and found the following antibodies: ab43176 - Rabbit polyclonal to PKC zeta ab4137 - Chicken polyclonal to ATP Synthase beta ab51157 - Rabbit polyclonal to PKC zeta ab59412 - Rabbit polyclonal to PKC zeta (phospho T560) ab62372 - Rabbit monoclonal [EP2037AY] to PKC zeta (phospho T560) We have a number of antibodies in our catalog that might be of interest to you. I would like to direct you to the search facility on our website (www.abcam.com). Please enter the name of the protein into the search box at the top of the home page. A list of products will be generated which can be further refined using the filters on the left hand side of the page. Using these filters will help you to identify products that have been tested in the applications and species you are interested in. I hope this information is helpful to you. If you have specific questions about the products identified during the search, please do not hesitate to contact me. Thank you for your patience and for providing details regarding your protocol. Ab4137 was characterized for use in Western blotting with rat brain and myeloid tissues. This antibody has not yet been tested for cross-reactivity with human samples. I would therefore recommend using rat brain or myeloid tissue as a positive control. The antibody is predicted to react with other mammals due to sequence homology, but this hasn't been tested so we cannot guarantee results. The originator of this antibody also mentioned that the calculated molecular weight is 67.7 kDa but it is common to find that the protein resolves closer to 76-80 kDa. I know that you mentioned seeing a band at approximately 50 kDa, but try the antibody again with a positive control (also, make sure that there are sufficient protease inhibitors in your sample buffer). I hope this helps, please contact us again if you need additional assistance. Customer is using this antibody in WB with rat samples. At a dilution of 1:250 and incubation overnight at 4C, there are no bands. Secondary is goat anti-rabbit at 1:1500 and is working with other primaries. Abcam lot# 105842. Thank you for your enquiry. Did you try increasing the concentration of the primary to 1:100? Please let me know if that improved your results. What specifically are the rat samples that you are using? Can you tell me as well, how did you store the antibody? Thanks again, and I look forward to hearing from you.